Out with a Bang 2010! Just wanted to say that my trip to the Music City Bowl was awesome. My husband and I had a really good time. Our seats were excellent and the game. Well... I should say it was quite interesting to say the least especially at the end when TN thought they had won. Then ended up they didn't. There is always next yr TN. I"ll post some pictures tomorrow. Just touching base, that this year was a really learning experience for me. Having been able to work with my friend the last yr and half. What I learned was tremendous. Thank you my friend. I miss you dearly.. My mom and dad are missed dearly as well. Testing my pouch has been something that should not have happened. But with doing the 5daypouchtest I learned that my pouch was indeed still working. And I have done extremely well since completing it. In the yr 2011, I will go back to the basics using this information that was learned from the beginning of my surgery from 2006 and this test. My list of duties will come next year. I've compiled the list with lots of things to share with you and I'm ready to get started with them. I will be taking them a day at a time and I hope that by posting them, this will help others that have had this same surgery and hope it will inspire them as well. Or help them. I won't linger on too long. As you know we only have a little time left in the yr 2010 and I have a few things to get completed that must be. I have some important coupons to use that will expire at midnight. As you know I am very much into couponing. It is a passion of mine or I should say a (hobby). I enjoy saving money and doing the challenges of seeing what I can get for free, taxes only or at the best lowest price as possible. I encourage others to use coupons. Yes it does take some time, however its rewarding especially when you are able to help others with your savings. Our food banks are always in need of help. God is Good! Tah Tah for 2010! And Happy New Year!!!!!!!!!! I'll see you next year. I'm getting excited, I went back to work today after being off yesterday. You know it feels like I have been off more than a day. It was really busy today. Trying to get everything completed and ready for year end. And someone else having to take care of my job while I'm out, I'm really grateful for my co-workers, they are excellent. Everyone is good about helping each other out. Especially when we are in a pinch. Then I'll be out thursday and friday. Going on a road trip to the Big Music City Bowl football game. I'm looking forward to it, I haven't ever experienced an event such as this, and what I've been reading its sold out and it should be crowded. I don't have anything orange. I did crochet me a orange/white scarf last year for Christmas does this count? Or do I need a hat/t-shirt etc. Any suggestions? I don't know what to wear. Wish this was my only dilemma I had to worry about, don't you? Today I started putting together my list I mentioned a couple of days ago, with what I need to do on getting back on track and hopefully helping others as well as myself. I'm looking forward to the challenge. I even read yesterday on facebook where Jillian Michael's is having a challenge, I thought about signing up for that one as well. I'm going to conquer and excel...... Anyone up for a challenge? We can do this... You can do this.... You are so worth it.... I'm so worth it.... It's taken me a long time to feel this way. And I can say I'm not about to abandon what I have worked so hard for. So if you need some support, come on over. Christmas may be over for another year, however, the reason for the season isn't. I look around and find every one still full of the love. My wish for this year is that: Everyone would continue to have this feeling all year. .... Can it be? Yes, I do believe so. Just stop when you think about the person that is being ugly to you. Say a little prayer for them, that God will give them peace within. Maybe a little warmth and compassion to change. It can happen, Everyone just needs to let it be about someone else instead of themselves. I know this includes me. I will be the first to admit, I get short sometimes. My goal is to work on these things as well. The next time I get a call with a stupid question, I need to stop and think. You know this isn't really a stupid question to them, they are just needing help. Or say something that sounds stupid, stop and think about really.... how does this sound to them? I've been there, done that and still do it at times, I sometimes blame it on a "blonde moment" ha. Ms. Clairol is to thank for that one. This season I have been better on myself, treated myself better. Time is healing me, slowly, real slow, however, I am getting there. I want to be able to do the things I used to love to do. My greatest passion is helping others and I hope to always continue doing this. My first step in the next few days is to compile a list of the things that I will be challenging myself to do with my weight to get back on track. I did really good over the holiday season. Just didn't go overboard. Not going to beat myself up. I'm starting over... like most of us will be doing. So come along with me and we can do it together. Should you have any questions, please send me an email. Ask, If I don't know the answer I will try and search til I find it or tell you if I can't. I'm here for you as well as myself. I will be bringing over some good information from a few of my other friends websites that have experienced the gastric bypass. I sincerely hope everyone has had a really good day today. I did, I was off. I will work tuesday, wednesday and be off Thursday through Sunday. I will also be on a road trip to The Music City Bowl in nashville, which I am really excited about. I won tickets from work with a day off with pay. Whats a girl to do. Yes take it. I haven't ever been to a football game like this so I'm excited. I'll take pictures and pass along. I just wanted to take the time to say Merry Christmas to everyone and thank you for a wonderful year. My family, friends. I hope everyone has been blessed. I know that I have. I have had a really good year all together. Although I am missing a few KEY people in my life. I still miss them dearly. Mom and Dad. And My very dear friend Bill. I want to say that I have memories that I will treasure forever. I had the pleasure of spending quality time with them when I needed to. My mother and dad blessed me with lots of knowledge and my Friend Bill did as well. As many of you know that I have been blogging due to my friend telling me that I needed to step outside my comfort zone. That was a blessing. I'm not going to stay on here long today, as I am spending time with my family, Husband and 2 sons. What a true blessing they are. I will be ready in a few days to get going back to blogging a bit more. Here is a picture of the beautiful snow that we are having here in Cleveland. Isn't it beautiful..
Merry Christmas To All and may you be able to be as blessed as I am. I almost forgot, I want to thank everyone for viewing my post, visiting my blog and the ones that entered my giveaway it was fun and I hope to do another one soon. Wishing everyone the Best of the Season. The winner is Michele. Please check your email. Ms. Missing in action here! Please hold the rescue elves back.. All has been completed, talking about procrastinating? Well I wasn't the only one. Traffic was heavy. Everyone racing to get what they needed for their special loved one. After I returned home on saturday evening, I drug the tree to the living room moved around some furniture, threw out some things that needed to be thrown out and made room for the tree. Lit the Holiday candle, cranked up the Internet with my favorite radio station Wusy 101 and began to sing and decorate. I'm so glad it wasn't live, Because folks you aren't ready for my singing just yet. I still have to tweak it a bit. Maybe in a few I'll be ready. I'm happy to report that the tree is up, decorated, goodies made. Well partially made. I have a few more to make but I'll save them for later in the week, I don't want my crew to get a sugar rush. And I'm ready as I'm gonna be for Christmas. Woo Hoo !!! Hope everyone else is too. After I got up sunday morning I put on me a pot of coffee, fixed my breakfast ate. I then proceeded to the drive way and picked up my 9 newspapers that my carrier so gracious delivers to me for my coupon fix. Since I knew there wouldn't be any major coupons, I just pulled out the parade magazine out of each one and the sales fliers so I could see if there was anything that I couldn't live without. I fixed my mother in law a cup of coffee in a to go cup and I was off to the nursing home. Sunday mornings, since I get the extra newspapers, when I take out my coupons, I take the newspapers to the nursing home. They love it. I stopped by with coffee in hand and a newspaper for MIL and she was eating breakfast. She wasn't feeling too well. Said she thinks she has pneumonia, sounded like it too. Please keep her in your thoughts and prayers as she recovers. Well I'd better go and get a few other things checked before trying to get a little shut eye before going to work this morning at 8am. I'll touch base again soon, I hope everyone has a really good Monday Morning. I'm going to leave you with this thought today, since its the holiday season. Smile at someone you don't know, tell them hello or perhaps give them a hug, make their day. Tell someone they look nice today. Or they look pretty. Forgot some of my extremely valuable coupons. My discount coupons for the bath and body works from the ladies at Time2Save and the coupon I received via email for my freebies. Also my Splenda coupons for my cooking goodies, You can pair this one up with the walgreens (diabetic coupon and you) booklet picked up at the pharmacy for a $1.00 off and with the coupon you print off from the splenda link it will make it free. you can do it twice. This will save me a little money. Would you like to win a Cvs $25.00 gift card just in time for Christmas? I'll be giving away (1) gift card. You could use it for shopping or to get some of the ECB items that go on sale. Or use it for aftersale items. Come on over and (1) follow me on my blog. Be sure to leave me a comment with your name and email address so that I will know how to contact you. I'll end this giveaway on Dec 18th.2010 at 10:00 pm Est. So hop on over and let me know if you like this giveaway, I'll keep it in mind and do more. Hope everyone is staying warm. It's been a little chili here in Tn the last week or so. Supposed to be really cold starting this weekend with a chance of snow flurries on Sunday. Guess I'm staying in and snuggle with my companion as my good friend would call him. As you know many of us have companions that hunt and this is hunting season. I snuggle while I can before he is off and hunting again next week. When I was close to 300 lbs before my surgery, I was always hot..... I sweated in the winter time and despised summer. Now I love summer and despise Winter. As I have lost my body warmth that I was used to having. The 1st winter that I went through after having my surgery, I lived under the electric blanket. My husband insisted that we get dual controls. I even slept under the blanket way into spring, until I finally got warm. I would run the blanket on High, have layers of clothing on, and my fuzzy socks. Now if that wasn't a sight to see???? I know doesn't sound to pretty does it? Now which ladies will confess that I'm not the only one that layers and sleeps in fuzzy socks since loosing the extra baggage???? Confess. we can leave it here.. Like those commercials you see. "What goes on in Vegas stays in Vegas". Well what goes on, inside my Shopping2Scale blog well sorry can't keep here.... Its too publicized. I love you though and hope you enjoy visiting. I just want everyone to smile have a little warmth in their hearts. And since its Christmas, thought I would share a few finger recipes to share with the family, friend or co-workers. So when you get through here, hop on over to the recipes tab and see what is in there. Hope you can use a few of them. I'm sharing these due to me not being able to tolerate sugar. There are a lot of family, friends, co-workers that get left behind that can't eat sugar. So thought you could make a special batch for them and let them know how special they were... It makes them feel good that you thought of them. Trust me I know on this one. The 1st couple of dinners/lunches we had at work everyone brought in goodies. I always had to pass. So I would always try and bring me a little something to eat. So I could be a part of the celebration. Also, while your here leave a comment on the Giveaway post and try to win a gift certificate for some sweets. Don't forget, to follow me so you will get the updates when I post. Do you have a sweet tooth for the holidays? I do, however, I have to restrain myself as these are so good. 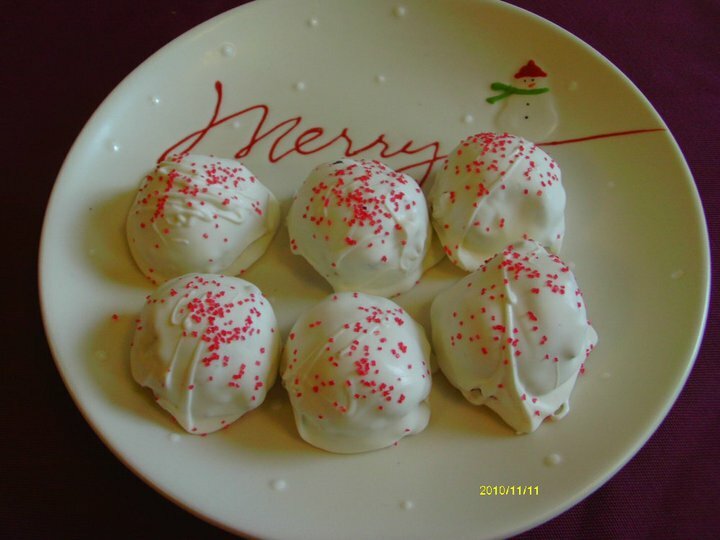 My friend Michele over at http://inspiredbyhimcakes.blogspot.com/2010/11/carrot-cake-truffles.html is making these awesome cake truffles. I'm sure you will love them. Please hop on over to her website and see if you think you would be interested. I'll be giving away (2) gift certificates $10.00 each. You can order her truffles 1/2 dozen, or dozen. She has several flavors to choose from. Hope you enjoy. Good Luck! I will end this give away Sunday evening December 11, 2010. This will give you enough time to get them ordered and to you before the holidays? Perhaps you are going to have a family get together or Company party, these would make an excellent finger treat. She also does cakes.